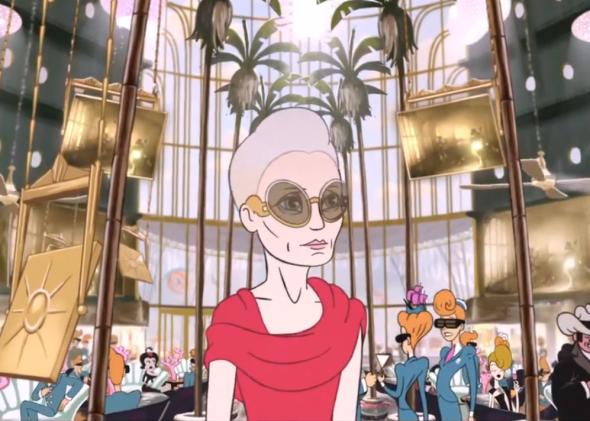 Robin Wright gets animated in The Congress. Ari Folman’s last film was the animated stunner about war, Waltz With Bashir, which came out in 2008. His follow-up, The Congress, will finally arrive in theaters this summer, and it looks mind-bending. The partly animated, partly live-action fantasy stars Robin Wright as a version of herself. In this alternate reality, she’s an out-of-work actress with an ailing son. “You had it all, Robin, a movie queen at 24,” her agent (Harvey Keitel) laments—a poster for The Princess Bride makes his point. Instead of suggesting a conventional career comeback, though, the Keitel character arranges a meeting with the head of Miramount Studios, who proposes an unusual deal: In exchange for hefty compensation, Wright will quit acting altogether and sell the rights to her likeness. She will become a digitally preserved “thing called Robin Wright,” as he puts it, for use in a future Hollywood. From there, the film transforms into a visually captivating spectacle. In one plane, the real Robin Wright attempts to save her son, while her digital version talks with an animated Tom Cruise—sadly, not voiced by the actor himself—and an animator (voiced by Jon Hamm) about their strange new world. The Congress comes to theaters Aug. 29.